Disarticulation occurs when there is a separation or amputation of a body part at the joint. Disarticulation can occur naturally or surgically, and can be due to trauma or disease. Preferred O & P Services is a part of the rehabilitation team that assists patients suffering from disarticulation. Shoulder Disarticulation: The separation of the arm from the shoulder joint. The entire arm is separated from the body with a shoulder disarticulation. Elbow Disarticulation: The separation of the lower arm from the elbow. Hip Disarticulation: The separation of the thigh (femur) from the hip (pelvic girdle). The entire leg is separated from the body with a hip disarticulation. Knee Disarticulation: The separation of the shin bones (tibia and fibula) from the thigh bone (femur). Ankle Disarticulation: The separation of the shin bones (tibia and fibula) from the ankle (talus). 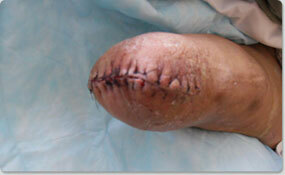 Ankle disarticulation is also known as a Symes amputation. When a surgical disarticulation occurs the surgeon is able to make a clean cut from the joint and increase the chances of a successful transition into prosthetic use. Preferred O & P Services fits patients suffering from disarticulation with custom-fitted prosthesis that will increase functionality after an amputation. 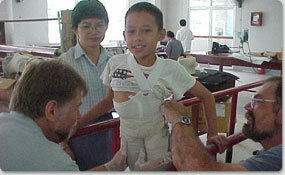 A proper fitting prosthesis is essential to help disarticulation patients regain lost function and mobility.